If you actually read this blog you’ll know I made English scones for the first time in August when we had a birthday afternoon tea fika for my mum. I was pleased with how they turned out, and though I like English scones sometimes there’s just that craving for a Swedish one. 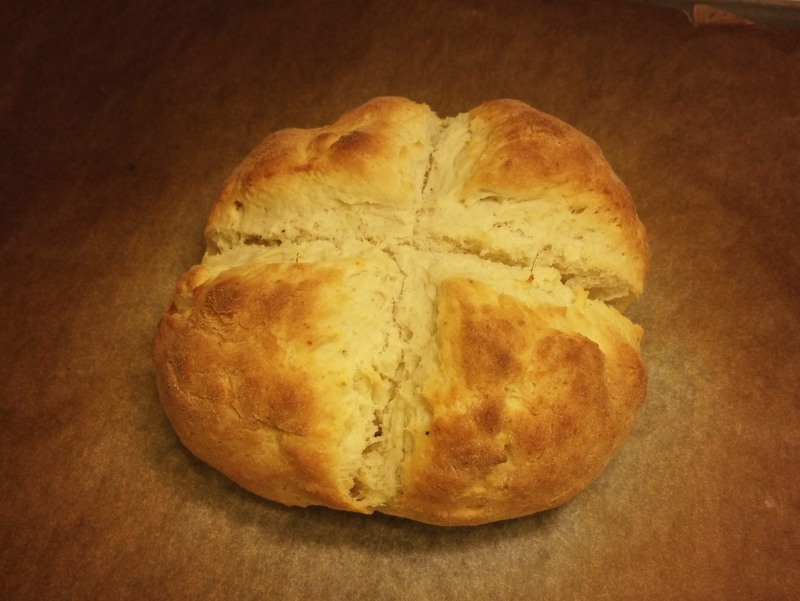 Swedish scones are nowhere near as dense as English scones, and they’re usually (at least among my family and friends) made as a bigger but flatter round shape which is scored with a cross in the middle – creating four tear-apart triangles when baked. The Swedish scones also, for some reason, feel a lot easier to make – but I guess maybe that’s just because I’ve grown up with making them? In any case there’s only four ingredients and whipping them up takes almost no time. You just need to have the patience to wait for them while they’re in the oven – and even that is only about 10 minutes! On Monday last week I had no food at home and really didn’t feel like cooking something for that night. I was tired after a week of bad sleep because of my pulled muscle (it’s getting much better by the way) and having gone to bed at 2:30 am after coming home from London and landing a bit after midnight. I had planned to throw something into the slow cooker to make food for the remainder of the week, but I didn’t feel any inspiration or want for dinner that night. But then when I was browsing recipes online I saw a post for scones and the craving hit me like walking into a brick wall. It was all I felt like then. 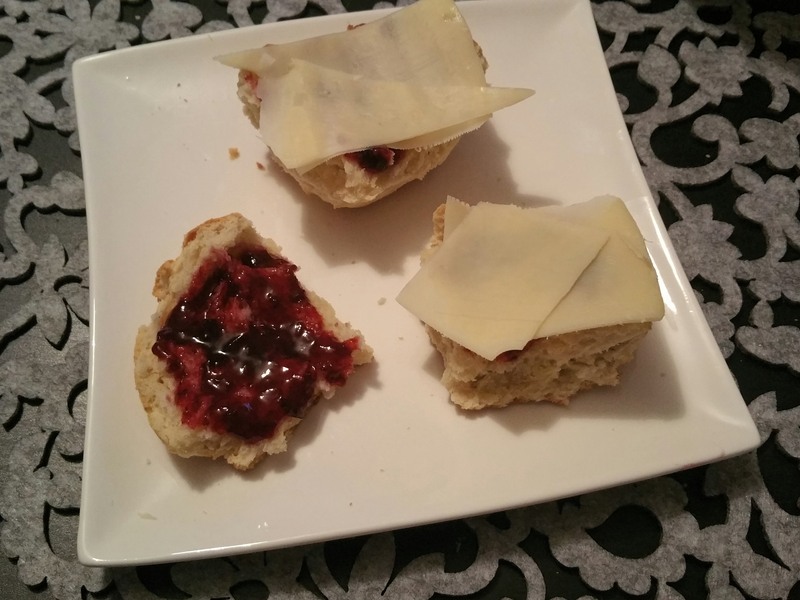 So I went to the supermarket and got my beef stew ingredients, whipped up the scones, whacked them in the oven, chopped up all my stew ingredients and threw them in the slow cooker, and then sat down in front of the tv to enjoy my still slightly warm scones with jam, cheese, and a cup of tea. It was heaven. Now the recipes for scones usually say that the quantities below make for 4 servings. As I’ve shown they can clearly also make for one. I have to say that I don’t agree with the four though, unless you have a lot of other things that you’re serving too, because they make rather small triangles. Instead I’ve opted to say it makes 2 servings. If you want to make more (I didn’t becasue I knew I would eat them all) you can easily double or tripple the recipe. Mix together baking powder, salt and flour. Add butter and ‘crumble’ until it’s a fine mixture without big lumps. Add milk and stir together to a slightly sticky dough. Press the dough out into a round shape. The bigger the round, the thinner the scones (obviously). Score with a cross through the middle and bake at 250 degrees Celsius for 8-12 minutes (depending on how thick). Enjoy with jam, cheese, butter, or whatever else tickles your fancy! The texture of these really is so much fluffier, and even if you decide you don’t like them you should at least try them once.